Why Bend a Perfectly Good Flat Light Bar? 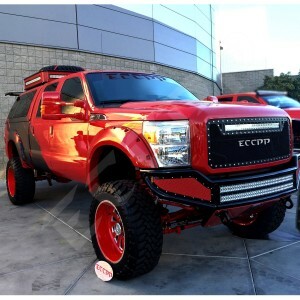 An LED light bar with a curve adds a definite touch of cool to any car or truck. It accentuates your vehicle’s contours triggers its share of double-takes from passersby. There is more to a curved LED light bar than just style and slightly improved aerodynamics however. The first reason as to why you might want a curved LED light bar is to gain more beamwidth. Flat light bars improve their beam spread using a combo beam configuration with optics that create a spot beam in the center and flood patterns at each end to illuminate the sides of the road. 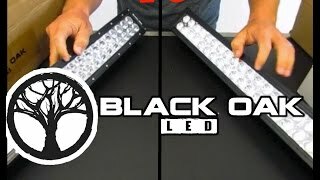 A curved light bar does this by aiming the LEDs to the sides. The best curved LED light bars do even more than add a radius curve to one of their flat, linear light bars to gain a wider beam. They tune the optics for each LED to make spot beams across the full length. With spot-tuned LEDs plus the curve you get both a wider beam width for side illumination and better darkness penetration than a flat bar with flood lights on each end. Compared to flat LED light bars, you have a smaller field of products from which to choose since curved light bars tend to be longer. Some are as short as 20 inches, but most models are 40 inches or longer. For curved light bars, our usual list of highest-quality suspects comes down to just two manufacturers: Rigid Industries and Baja Designs. 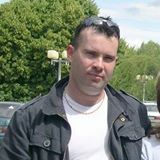 That is because Vision X, CosmoBlaze and Lazer Star have no curved LED light bars. Baja Designs’ curved line is the OnX6 Arc Series in 30, 40 and 50 inch lengths. 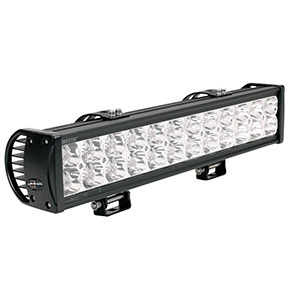 The Rigid RDS-Series has light bars in 20, 30, 40, 50 and 54 inch lengths. 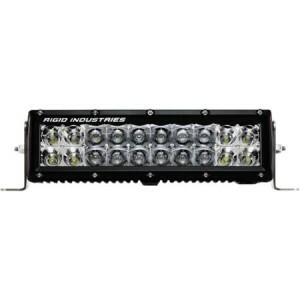 Beyond those, you must look to other good quality light bar makers such as Mictuning, Xtreme®, Eyourlife and Shanren. With these brands, study buyer reviews carefully as they sometimes are not as bright or a s long-lasting as top brands, although they are certainly economically priced. 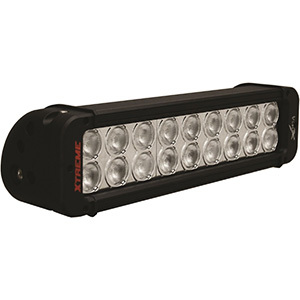 Rigid Industries’ RDS-Series 30-inch Spot LED Light Bar, Model 88321, represents what the best curved LED light bars are all about. 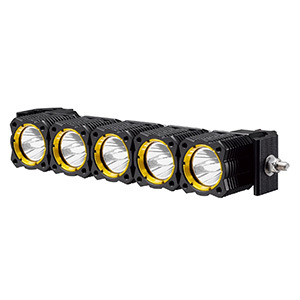 It is an arced version of their famous E-Series light bars and thus, features a tough, extruded aluminum housing and heat sink, 60 top-bin 5W CREE LEDs in a dual row array, 15,690 raw lumens of light output, an IP68 rating and a 16.3A power draw. What really sets it apart is the fact that all the LEDs, using Rigid’s patented Hybrid optics, emit a narrow 10 degree light cone. That means the entire light is tuned as a spot beam and the curve provides the light spread to illuminate the entire scene. 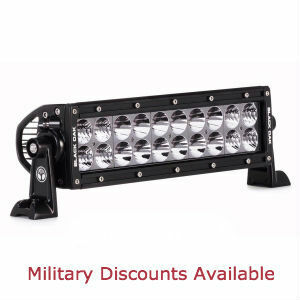 You will not find another light bar that penetrates the gloom off to the sides better than this one. Curved LED light bars not only lend a sleek, futuristic look to your vehicle but they have improved aerodynamics and, most importantly, superior side lighting ability compared to flat light bars. They are a bit harder to find and only come in longer lengths but are well worth considering if the curved look matches your vehicle’s contours and you want the brightest, most penetrating light spread possible.